This is a picture of me using leaves to kill grass to expand the garden last year. I can't believe it's almost December, and then it's 2017, and I haven't gotten half of the things done that I wanted to do. Thing is, I just got burned out trying to do too much, and now I'm going to relax and concentrate on building the soil in the beds instead of expanding them any more. I'll let all the tender plants die back and reconfigure the bulbs, etc. so they will grow and thrive. Luckily, I have a lot of leaves around here to use for mulch and soil amendment. Today, I was racing the yard crew to get my elm leaves raked before they came through to mow. The guy who runs the mower on my side of the complex is a good ole' country boy, and if he sees me out there working, he'll just mow slowly or do other areas and come back to my tiny little strip in front of my apartment. He and I have talked, and he likes to garden too, so I was happy to see him on the mower today. 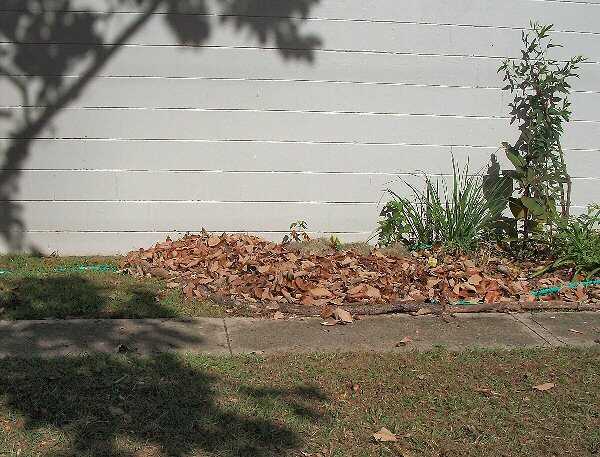 I got all the elm leaves raked today, and got most of the then-fallen oak leaves yesterday. I didn't want to really cover up the gardens yet, so I put the leaves into the courtyard. It looks really strange out there now, but it gets covered in leaves in the fall anyway, because a lot of the oak leaves blow into it. As the outer gardens die down, and there are plenty more to fall. I'll carry these out of the courtyard and put them into those beds, and of course, leave some in here too. The leaves will keep the earthworms warm and well-fed in the winter. I'll water them tomorrow to mash them down a little. 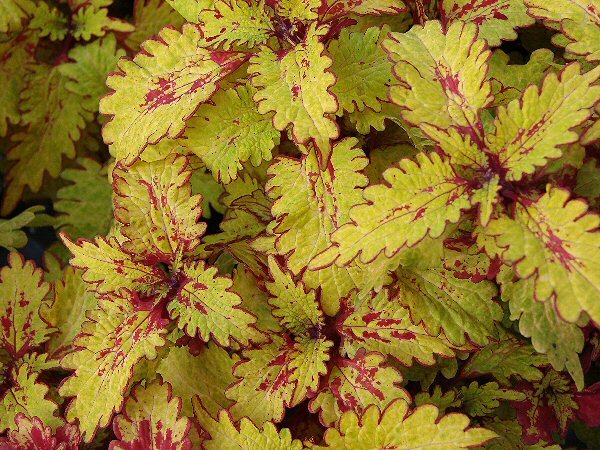 It takes awhile for them to settle in and stop blowing around, but once they mat down, they make a great ground cover. When they're loose, I worry about spiders crawling over my feet when I walk through them. I could get many more leaves if I wanted, because this place is full of trees. If I felt like picking out the pine cones, I could get pine straw. I should have picked up Spanish Moss after the storms this summer, but I didn't, so I'll try to get a bit now to put over the top of the leaves to make it a little more attractive. People look at me weird when I start raking and picking up moss, but I don't care. They love my flowers, so they should appreciate how I grow them. If I won the lottery, I'd buy this place and turn it into a complex for gardeners. Not as much veggies as ornamentals, but still, I'd let them use the land around their apartments to plant whatever they wanted.That isn't going to happen, so I guess I'll just be happy with what I have. Hope all of you are getting bountiful amounts of leaves for your gardens. Free soil amendment and compost material is never a bad thing.